I am, if you have not figured it out already, a Trekie. There is no way around it. I have seen most of the episodes at least twice, and I have seen all of the movies at least 5 times and I can quote Wrath of Khan forwards and backwards, and can probably tie a quote from that movie into pretty much any conversation you like. Having said all of that, I do have my favorites. No, I am not going to bore you with a list of them. Not today at least. One thing that I don’t do is write Star Trek Fan Fic. I am not saying that doing so is a bad thing, just that it is not something I have ever really done. But there is one idea, during one episode that came close. Star Trek The Next Generation (STTNG) got off to a rocky start, but what franchise doesn’t, by season three or four it had settled into a pretty comfortable rhythm. One that was good enough to launch Deep Space 9 and Voyager. Say what you want about any of them, they did bring Star Trek back to TV and I for one was very happy with that. And while I liked many of the episodes and ideas these three series explored, I was never really tempted to write fan fic about any of them. That all ended when I saw, Season 7 Episode 11 Parallels. 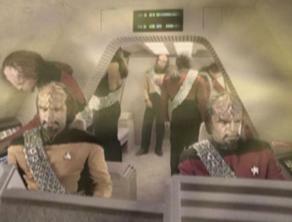 In this episode Worf returns from a tournament and quickly finds that this is not his Enterprise. Worse, it keeps changing to be further and further from the Enterprise he knows. Eventually some techno babbel happens that makes the mutliverse split open and reveal every possible Enterprise at that point in time. For more details about what happens you can click the link to Memory Alpha above, or watch the review from SF Debris below. Side Note: SF Debris is one of my favorite SF reviewers on the web. I don’t always agree with him, and he has a serious case of potty mouth, but he is pretty fair and tells you why he thinks what he thinks. He can differentiate, between problems caused by the actors, the writers, or the concept and includes that in his reviews so I really like what he does. Here is the review of Parallels. Let’s back up for a moment. How did this Enterprise get to this point? I am not going to go too far back in history here, but let’s talk about what happened that might have led them to this point. Way back in Season 2, Q introduces the Enterprise to the Borg, and for the first time in Star Trek history, they meet an enemy that they can’t talk their way around, or even defeat. 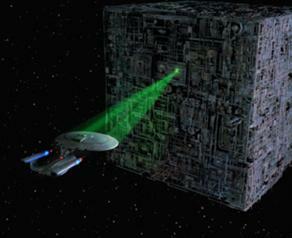 The Borg did not come back until the break between season 3 and 4. At that point, one Borg Cube not only attacked the Enterprise, but was able to wipe out a fleet of ships sent out to stop them at Wolf 359. They were only able to defeat the Borg by tricking them, and when the Borg figured out there was a problem, they blew themselves up rather than be captured. 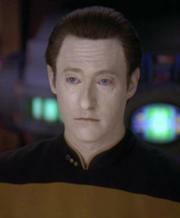 In this alternate time line, the one where Captain Riker begs not to be sent back, the encounter at Wolf 359 went the other way, instead of the Enterprise being able to take Captain Picard back and trick the Borg, the Borg were able to defeat them, proceed on to Earth, and according to what Riker says, destroy the federation, likely also taking most of the federation planets. While this is not the brightest future it is a pretty interesting timeline to follow, and one I think would have been worthy of following up on. Only one other Star Trek episode ever really attempted to do this, although the Star Trek Voyager Episode, The Year Of Hell comes close. The Episode of Star Trek Enterprise, Twilight, while it does not deal directly with the defeat by the Borg at Wolf 359, it deals with another defeat that was equally as devastating. In this episode, the Xindi were able to launch their weapon and destroy Earth. It turned the Star Trek story on its head. Instead of being the story of the Enterprise boldly going, it is the story of the Enterprise running and hiding, leading what is left of humanity in a desperate attempt to stay alive. One of the trade marks of Star Trek, the thing that really makes Star Trek what it is, is the optimism. This is what make Star Trek so popular. There is a future for humanity and it is pretty bright. What attracts me and I suspect others to this idea is that, while we like the hope and optimism that Star Trek brings, we like to play that what if game. That is what would make, following the Enterprise D from the end of the Episode between season 3 and Season 4 (The Best of Both Worlds) to the end of Parallels such and interesting story. The story of Enterprise D leading what is left of humanity to run and hide from the Borg, hunted and haunted by their defeat. While other shows, and other series more recently have explored this theme, I think it would have been pretty interesting had STTNG explored it further. This concept is probably the one story line that brought me closer than any other two writing Star Trek fan fic. Is there a story within Star Trek or your favorite series that you thought could be explored more and interested you in writing Fan Fic? Or have you every written fan fic, and if so about what?